What a night for sports. Before we get to the main event, there were some crazy fights leading up to it. The craziest one was this knockout by “The Black Beast,” Derrick Lewis. After being dominated by Volkov for most of the fight, Lewis caught his Russian opponent with a haymaker to end all haymakers. His post-fight interview with Joe Rogan was even better. No one likes hot balls, right gentlemen? Moving on, Anthony Pettis against Tony Ferguson was also exciting, with the former champion Pettis almost pulling off the upset. However, a broken hand in the second round declared the match over in favor of Ferguson, who now wants his chance to fight Conor McGregor. 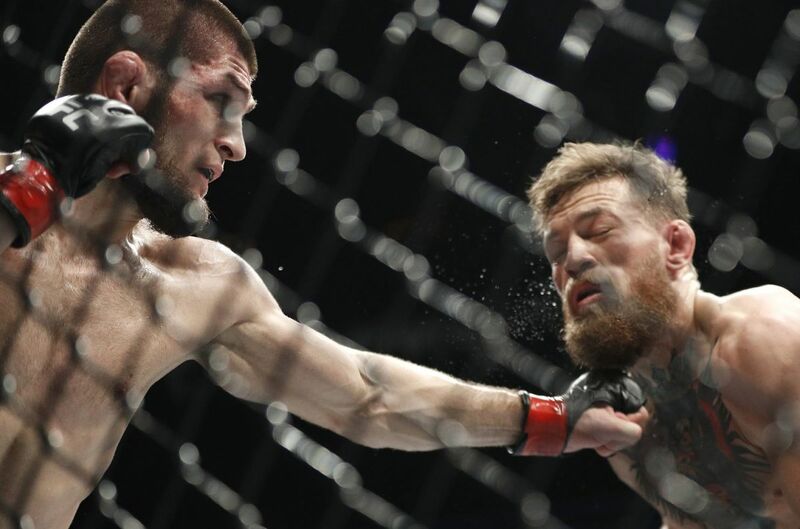 Speaking of McGregor, he never really stood a chance against Khabib, who dominated the ground game and eventually forced McGregor to submit with a choke-hold in the fourth round. While the fight itself was uneventful, the ensuing riot that broke out afterward was more entertaining. Someone better call Ron Artest and Stephen Jackson. All jokes aside, last night’s antics looked to be retribution for McGregor’s hand truck throwing incident at the Barclay’s Center a few months ago (remember that, McGregor fans?). Although distasteful to say the least, you can understand where Khabib was coming from. Still, he won the fight rather easily and shut McGregor up. I guess that wasn’t enough for him, though. Man, David Price cannot get out of his own way, can he? Last night was his chance to silence his haters. To prove that he could pitch in the postseason and that he could shut down the Yankees. Unfortunately, things didn’t exactly go as planned. Price clearly looked rattled as he was chased from this game in the second inning after allowing three runs. Unfortunately, the Red Sox couldn’t muster much offense against Masahiro Tanaka and the Yankees bullpen. Sanchez added another three-run homer later in the game, and the Bombers would go on to win 6-2. We officially have a series folks, as things will shift back to Yankee Stadium for a pivotal game three on Monday. Rick Porcello will face off against Luis Severino in a must-win game for either team. It’s worth noting that the Yankees have been undefeated (7-0) at home in the playoffs since last year. The pressure is definitely on for the Red Sox to break the streak. I know you’re probably thinking, “The NBA preseason? Really, Tyler?” Really guys. Yes, there were some exciting college football games yesterday, and yes, there was more playoff baseball outside of the Yankees and Red Sox, but this needed to be talked about. The game itself was your typical “who cares” NBA preseason game, but like McGregor vs. Khabib, the extra activities that ensured during and after the game were big points of interest. Let the record state that I would never mess with Marcus Smart. Clearly, that isn’t the case for J.R. Smith, who Smart has a well-documented history with. Smart was ejected and gestured toward the Cleveland crowd (which will probably earn him a suspension), but his interview after the game is what will terrify you. That look towards the camera, yikes. Despite keeping his cool on the surface, Smart is clearly fired up and wants to destroy J.R. Smith. If the reports of Smith saying stuff about Smart’s recently deceased mother are true, then he’ll deserve everything that’s coming to him. This is definitely a storyline to watch for the upcoming NBA season. Rivalry night appeared to be the theme last night in sports, and none of the events listed above disappointed. This bad-blooded day in sports will be talked about for a while. Now that it’s over, all we can do is reflect and look forward to another NFL Sunday. Next Post Next post: What Happened to Steve Mason?